Select plump, fresh sardines and wash them thoroughly in water inside and out. Remove the heads. Sprinkle with ground pepper and ginger. Add saffron dissolved in a little water. Add raisins, sliced almonds, pine kernels, parsley and mint. Mix with olive oil. 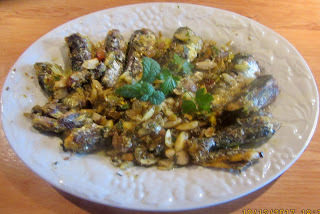 Soak sardines in this mixture for three hours. Strain reserving the oil and separating the nuts, raisins and herbs from the fish. Heat a pan over a few coals. 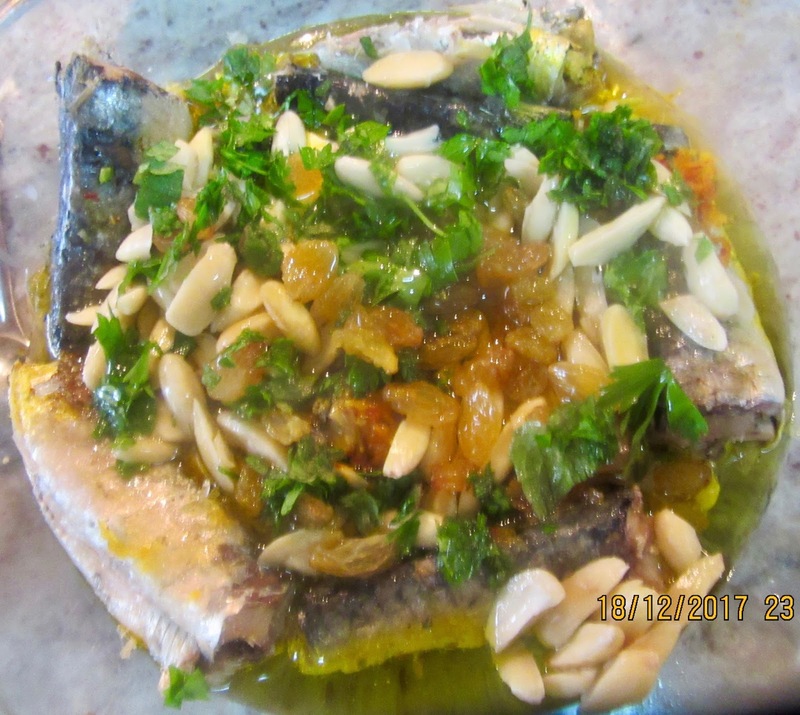 Do not cook in the oven because it is too hot for sardines. Add strained oil. When hot add sardines. Sprinkle with the nuts, raisins and herb mixture. Cook slowly. This recipe is a must for all sardine lovers! If it is desired, prepare them in another way such as frying them, add pepper and a little vinegar or orange juice and if roasting is preferred add orange juice and olive oil and salt with a little water, pepper and any herbs except marjoram.